Louis was on parade again today at the Rhodesian Ridgeback Club Of Great Britain Championship show. He came second in his class which we’re very pleased about. He’s asleep in his den at the moment whilst I’m enjoying a cold beer and watching one of my favourite movies, The Quiet Man. It’s been another long day in the bathroom but progress is good. The shower outlet is done. I’d tested the hot and cold inlets yesterday so had to plumb the outlet this morning after heading out to buy a sealing washer. The plasterboard is on and the wallpaper on the other side is now off, along with the radiator. Tomorrow is tiling day. Should be fun. We are having such a good time training for Louis’ Silver Good Canine Citizen Award. I can wholeheartedly recommend Knutsford training centre where we go. No choke chains, no shouting, no forcing; all the dogs have a wonderful time, it’s like one big play session. We put all the training into practice when we go out and about and I love it when people come and pat him and say what a lovely boy he is. We are looking forward to seeing the babies at the G. B. Club Show this weekend. Sue, Sassy, Jan, Zuri and last but not least Chris and Bertie. For Sue, thanks for the guestbook message. I had absolutely nothing to do with setting this web site up, it was my far better half, Andy. Andy is the brain in this family*, he allows me on to blog and pick pictures from time to time. Despite my best efforts to try and keep Louis’ hairs off the car seats here’s a picture of him thwarting me by shoving his head between the rear seat rests. Louis is relegated to the boot in this car as I spent days and days getting his short hairs out of the material weave of the rear seats of the Golf before I had to hand it back to the lease company. Even then there must have been enough hair left in there to weave a jumper. 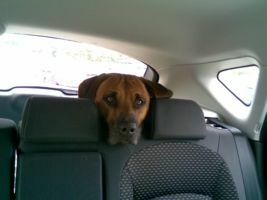 We were waiting for Sue at Tesco’s – she was busy getting him a large bag of his gravy bones. God forbid we run out of treats for Louis! We can be down to the last tin of beans and some curled up bread but no way will we ever be short of supplies for Boy Wonder Hound! Louis was also on parade on Friday at the City of Birmingham Canine Association. Unfortunately he wasn’t placed but Sue and Louis had a good time. Louis looked good and Chris ran him beautifully as usual. We’ll keep our fingers crossed for the next show! :-)bg Louis and I went on our travels to the south of Wales yesterday. Louis got a second, he looked very handsome. We love that show, it’s so relaxed and I managed to chit chat to lots of people. One of the breeds I particularly enjoyed watching were in the next ring, deerhounds. What an elegant gentle giant. It always impresses me how people manage to walk about with several well behaved big dogs. My Tom Tom decided to go on the blink on the way home so we took a slightly different route home ( Chris always says she knows the way) famous last words :-)cz When we got home Louis tore round his garden and as usual got his pampering from Andy and the neighbours, beer flowed and hangovers were created. What a difference a sunny day can make.